A memory house is a construct originating in the Middle Ages. The idea is if you visualize a house and you imagine putting facts and ideas in specific nooks and crannies in the house, you can always go there. The visualization helps you remember. I find it hard to visualize a house. I find it hard to decide to remember. --Katia in the college admissions essay that her mother is trying to persuade Katia to print out and mail off before before a deadline passes. Kathleen Tolan's Memory House is a small play with a big heart. 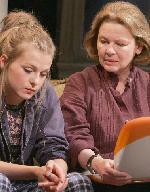 The crisis in the lives of its two characters -- Maggie (Dianne Wiest), a woman in her fifties and Katia (Natalia Zvereva), her eighteen-year-old daughter -- is the impending deadline for submitting the mini memoir type essay required for admission to the college of her choice. The essay's topic not only gives the play its title but triggers one of those bouts of teen-aged weltschmertz and hostility towards --who else? -- the mother. Actually, the essay is something of a final straw in an extended what's the use streak of rebellious behavior that anyone who's ever lived with a teenager will recognize. The essay's focus on looking forward by looking back is the Pandora's box that spills forth buried feelings about Katia's baby and toddler years in Russia and all sorts of other anxieties. Maggie's challenge is to get Katia to meet the New Year's Eve deadline and get on with the good life she wants her to have. There isn't a whole lot of suspense or action to all this but there is a heap of good acting from Dianne Wiest. She imbues Maggie with equal parts of warmth, whimsy and wistfulness. It's a pleasure to watch her deftly make Tolan's best lines even better. Her Maggie is so likeable that you root for her gently insistent nagging to win the day. Eighteen-year-old newcomer, Natalia Zvereva, handles the less sympathetic role of the disgruntled adolescent with impressive confidence even though she lacks the range to give us more of what lies beneath the angry exterior. She does handle the occasionally too polemical speeches Ms. Tolan has written for her with enough emotional fire to make one feel that with a little more guidance from director David Esbjornson her Katia could have had been more nuanced and less of a consistent whiner. After a brief scene-setting excerpt from a home-made movie showing six-year-old Katia bouncing a ball in the Russian orphanage that was her home before Maggie and her now ex-husband adopted her, the play becomes a verbal Ping-Pong match. The only real action comes from Maggie's relieving her own tension by baking a blueberry pie (her first ever active use of a pie recipe in Irma Rombauer's Joy of Cooking). And so, as Katia sulks on the couch of Loy Arcenas' well detailed living room-kitchen, Maggie mixes sugar and flour, kneads dough and chatters away -- and the family history is revealed bit by bit: Maggie's years of infertility. . . the curiosity about the background she always rejected spurred by another Russian adoptee's plans for seeking out his birth mother. . . the divorce that has Katia navigating her father and mother's Eastside and Westside Manhattan domiciles and apparently robbed Maggie of the will to meaningfully go on with her own life after the end of both a career as a dancer and her marriage (as Maggie puts it, "Fifty percent of all marriages in this country are across town with new mattresses;. Or anyway not in the original sagging beds."). . . the love and concern for her mother's increased loneliness if she goes off to college that underlies her procrastination about the essay as much as the uncertainty of living in a country that's become "a schoolyard bully." As in The Wax, which also premiered at Playwrights Horizon, Ms. Tolan once again demonstrates that innocuous situations can result in enjoyable theater. While my colleague Charles Whaley found the pie baking somewhat distracting when he saw the play at the Humana Festival, that distraction is terrifically entertaining. Without that Joy of Cooking recipe as a metaphor for the joy of life that Maggie as well as her daughter need to grab hold of again, we wouldn't have Wiest's spot-on little monologue about how a whole book could be written about a single berry. The on stage baking and its symbolism don't lift this ordinary people two-hander into the ranks of forever remembered plays, and neither is the pie that finally comes out of the oven a culinary masterpiece. But, with Ms. Wiest as the droll baker, it has enough juicy flavor and sweetness to make Memory House a tasty repast. Tuesdays through Fridays at 8 PM, Saturdays at 2:30 & 8 PM and Sundays at 2:30 & 7:30 PM.